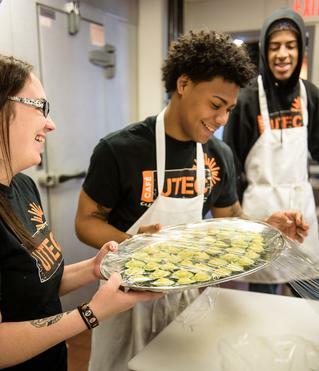 January 12, 2017- The UTEC Community Kitchen is the latest expansion of its food services social enterprise on Warren Street. The new 5,000-square-foot commercial-grade kitchen includes seperate work lines and equipment for food manufacturing. The kitchen will be available to rental users, so Lowell’s food entrepreneurs won’t have to travel outside the city for food-production space. Its design is intended for multiple users so that UTEC operations and other food businesses can share the space. Three groups will be able to work simultaneously in the kitchen, which has a versatile space with large ovens, fryers, mixers, processors, packing, and labeling equipmen, refrigerator and freezer space, dry storage space and more. Renovating the space and creating the kitchen was a $750,000 project funded mostly by grants and donations. To read more on UTEC’s Commuinity Kitchen Click Here. © 2018 - 2019 Affirmative Investments. All Rights Reserved.